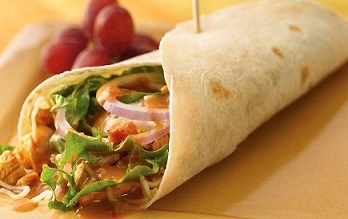 Make a sandwich wrap for lunch or dinner fast and easy with this Mexican Chicken Wrap. 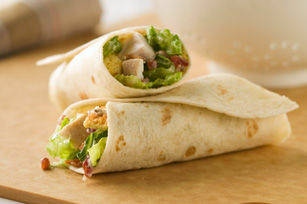 Wraps began becoming popular in America when Bobby Valentine, former New York Mets manager, put a sandwich together using a tortilla instead of bread. He added the sandwich wrap to the menu of his restaurant in Connecticut (Bobby V's). The "wrap" was off and running! 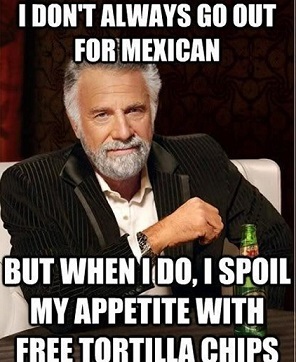 But I believe the "wrap" had to have originated somewhere in Mexico or at least the south west. I can't imagine why Mexicans or early Texans wouldn't have initiated the practice of wrapping a tortilla around other ingredients. It almost seems a natural thing to do. Wrapping ingredients in a low carb tortilla became a favorite thing to do as a low-carbohydate alternative to sandwich breads. Other ingredients often included are shredded lettuce, diced tomato, Pico de Gallo, guacamole, salsas, sautéed mushrooms, peppers, grilled onions, bacon, shredded cheddar cheese, and ranch dressing. This Mexican-style chicken wrap has many of those ingredients, but some are introduced in the form of a delicious roasted salsa (the recipe on this website - just a click away). 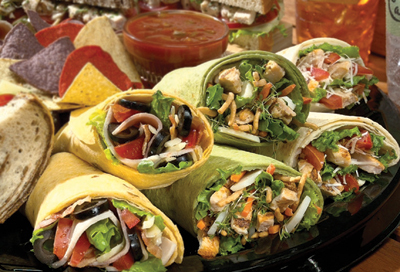 Enjoy your Mexican Wrap recipe and the company of those you share it with!